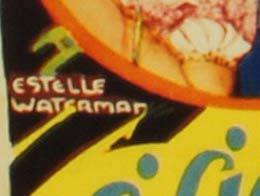 Estelle Waterman was a Commercial Artist in Sydney who produced artwork for various movie posters that were printed by Marchant Printers in the 1920s. Little is known about her but her art deco style on the long daybill for Crazy Mazie is a good indication of her talent. With Lilian Harvey, Harry Halm, Hans Junkermann, Julia Serda.